gallamore west: Blue Goose Boutique Giveaway! 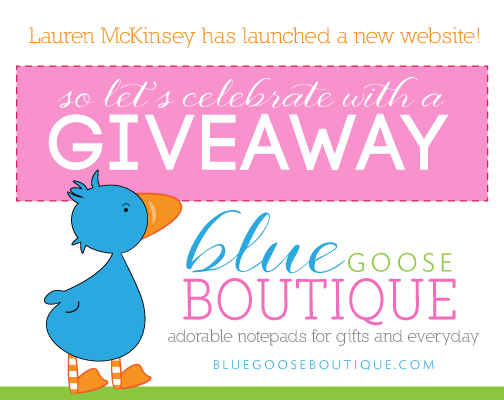 I'm thrilled to share some exciting news with you today- the Grand Opening of Blue Goose Boutique! Blue Goose Boutique is full of adorable notepads created with love by Lauren McKinsey, one of the sweetest people I know. Lauren creates the most adorable printable collections around and her signature logo is a cute little blue goose, thus the name of her cute new shop! Visit Lauren McKinsey online to see all of her amazing printable collections. She has SO many cute printable collections, and she even has a CUTE CLUB membership- members pay one low price and have instant access to EVERY printable collection. I'm a Cute Club member and ohhh, I LOVE it!! You could win a one-year membership to Cute Club, plus a $50 credit to Blue Goose Boutique and more below!